A lack of agricultural disturbance since the fifties whereby the 6 acres of Treborth’s grounds had experienced no artificial fertiliser, nor herbicide nor plough, began an important tradition continued to the present day of managing much of the field area at Treborth as meadow plots, cut just once or twice per year and in the meantime yielding an attractive floral display with all its attendant insect and other animal life. These plots contain over 150 native plant species as well as hundreds more taxa of fungi and invertebrates and as such are one of the most diverse parts of the botanic garden. This focus on meadows reflects conservation concern for natural grasslands throughout Wales, and indeed the British Isles. 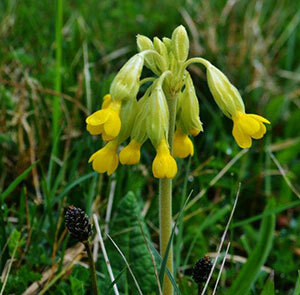 The decline of the traditional hay meadow has been widely highlighted and here in Wales has resulted in significant losses of diversity in plants, fungi, birds and insects. One of the prettiest grassland plant species, Meadow Clary (Salvia pratensis) is now officially extinct as a wild plant in Wales, dying out in its final site, in Monmouthshire, this year. Through Trevor Dines, PlantLife Officer for Wales, Treborth acquired seed a few years ago from the SE Wales site and the resulting plant, which flowers reasonably strongly on the rock garden, is one of the most precious specimens we have in our conservation collection. We also grew 24 seedlings on which were transported down to their original site in Monmouthshire in 2015 as part of the Salvia pratensis conservation project with National Botanic Garden of Wales, Bristol Zoo and Natural Resources Wales.